The potential spectrum of applications of these “super connections” is extremely broad, ranging from metalwork in industry right through to safer implants in medical technology. Their results have now been published in the prestigious journal “Nanoscale Horizon” of the Royal Society of Chemistry. 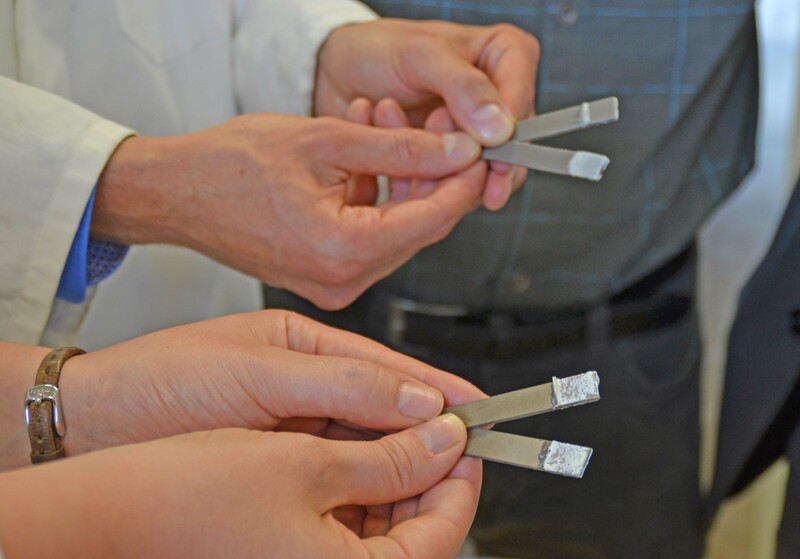 The targeted etching process of “nanoscale-sculpturing” roughens the upper layer of metal (here aluminium, 20 µm = 0.02 mm), thereby creating a 3D-structure with tiny hooks. “We have now applied a technology to metals that was previously only known from semiconductors. To use this process in such a way is completely new,” said Dr. Jürgen Carstensen, co-author of the publication. In the process, the surface of a metal is converted into a semiconductor, which can be chemically etched and thereby specifically modified as desired. The surfaces of metals consist of many different crystals and grains, some of which are less chemically stable than others. These unstable particles can be specifically removed from the surface of a metal by a targeted etching. The top surface layer is roughened by the etching process, creating a three-dimensional surface structure. This changes the properties of the surface, but not of the metal as a whole. This is because the etching is only 10 to 20 micrometers deep – a layer as thin as a quarter of the diameter of human hair. 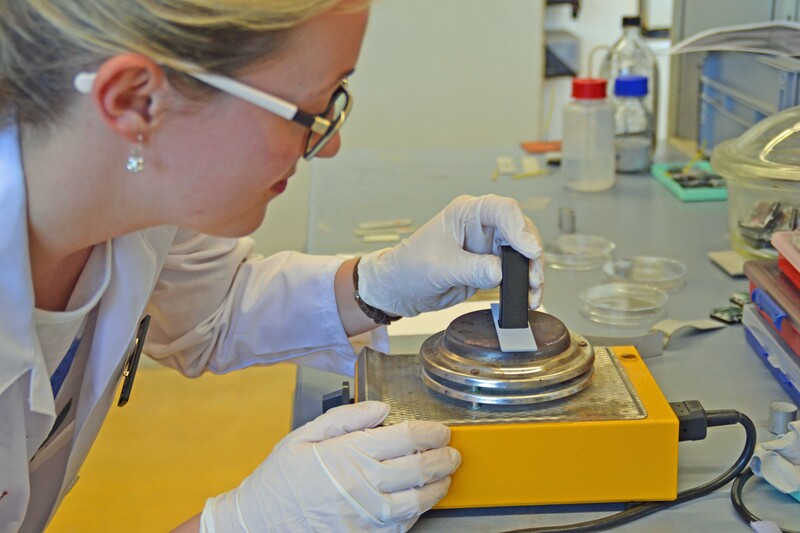 The research team has therefore named the process “nanoscale-sculpturing”. Through the etching process, a 3D-structure with tiny hooks is created. If a bonding polymer is then applied between two treated metals, the surfaces inter-lock with each other in all directions like a three-dimensional puzzle. 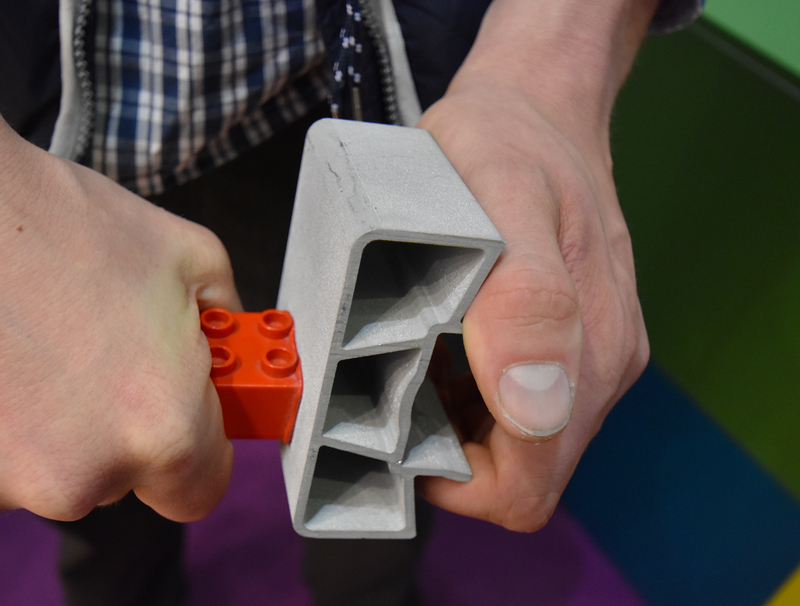 “These 3-D puzzle connections are practically unbreakable. In our experiments, it was usually the metal or polymer that broke, but not the connection itself,” said Melike Baytekin-Gerngroß, lead author of the publication. Even a thin layer of fat – such as that left by a fingerprint on a surface – does not affect the connection. “In our tests, we even smeared gearbox oil on metal surfaces. The connection still held,” explained Baytekin-Gerngroß. Laborious cleaning of surfaces, such as the pre-treatment of ships' hulls before they can be painted, could thus be rendered unnecessary. In addition, the research team exposed the puzzle connections to extreme heat and moisture, to simulate weather conditions. This also did not affect their stability. Carstensen emphasised: “Our connections are extremely robust and weather-resistant.” A beneficial side-effect of the process is that the etching makes the surfaces of metal water-repellent. The resulting hook structure functions like a closely-interlocked 3D labyrinth, without holes which can be penetrated by water. The metals therefore possess a kind of built-in corrosion protection. “We actually don't know this kind of behaviour from metals like aluminium. A lotus effect with pure metals – i.e. without applying a water-repellent coating – that is new,” said Adelung. 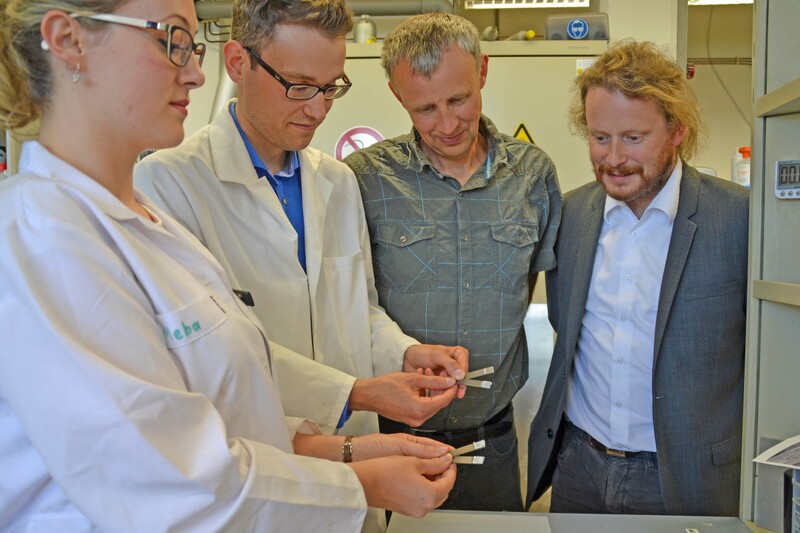 “The range of potential applications is extremely broad, from metalworking industries such as ship-building or aviation, to printing technology and fire protection, right through to medical applications,” said Gerngroß. Because the “nanoscale-sculpturing” process not only creates a 3D surface structure, which can be purely physically bonded without chemicals – the targeted etching can also remove harmful particles from the surface, which is of particularly great interest in medical technology. Titanium is often used for medical implants. To mechanically fix the titanium in place, small quantities of aluminium are added. However, the aluminium can trigger undesirable side-effects in the body. “With our process, we can remove aluminium particles from the surface layer, and thereby obtain a significantly purer surface, which is much more tolerable for the human body. Because we only etch the uppermost layer on a micrometer scale, the stability of the whole implant remains unaffected,” explained Carstensen. The researchers have so far applied for four patents for the process. Businesses have already shown substantial interest in the potential applications. “And our specialist colleagues in materials sciences have also reacted enthusiastically to our discoveries,” said a delighted Adelung. 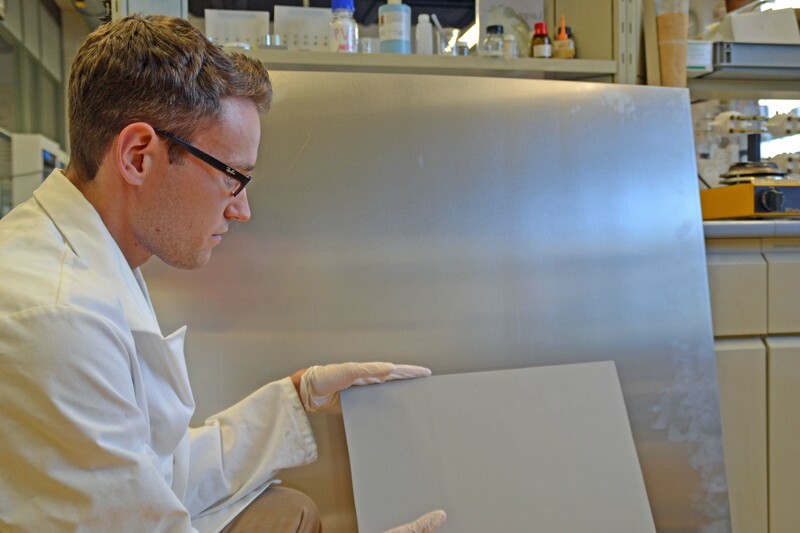 Caption: A strip of aluminium – the surface of which has been treated with an electro-chemical etching process – is permanently bonded with thermoplastic by heating. 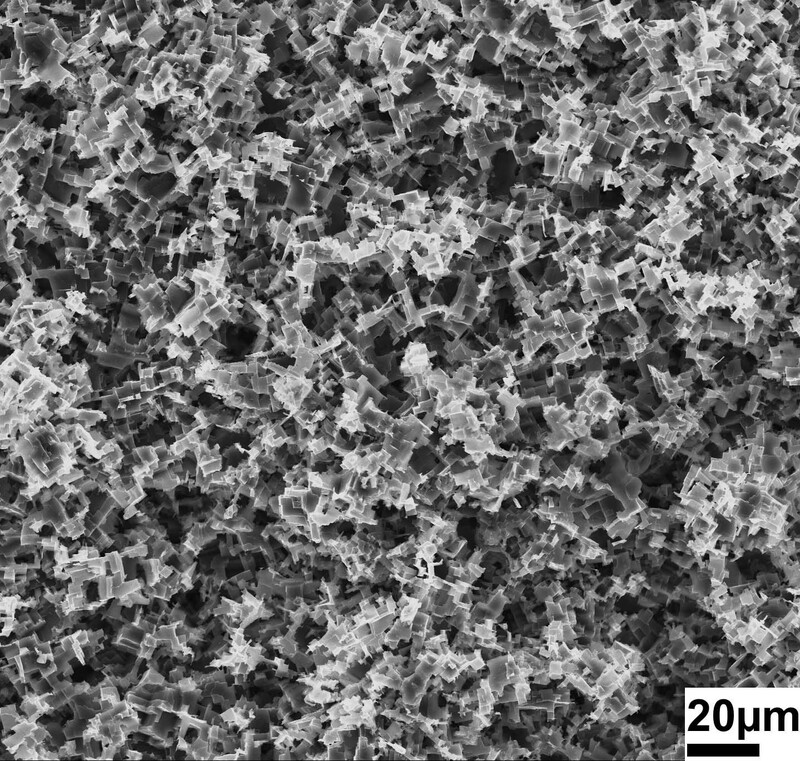 Caption: Large metal surfaces can also be treated with nanoscale sculpturing. Although the etching is only applied to a thin layer on a micrometer scale, the resulting change is visible to the naked eye: the treated surface of the aluminium in the foreground has become matt. Caption: The Kiel-based research team of Melike Baytekin-Gerngroß (on the left), Mark-Daniel Gerngroß, Jürgen Carstensen and Rainer Adelung compares test results in the laboratory. Caption: Aluminium plates which have only been sandblasted (in the background of the picture) cannot be glued successfully. The two glued plates separate again at the interface between glue and metal – this can be seen by the fact that there is no white glue residue visible on one of the two plates. The aluminium plates in the foreground of the picture were treated with the etching process “nanoscale-sculpturing” before being glued. These plates could also be separated. But the white glue particles left on both plates demonstrate that the bond between metal and glue is not broken, but rather the glue itself. The targeted etching process of “nanoscale-sculpturing” roughens the upper layer of metal (here aluminium, 20 µm = 0.02 mm), thereby creating a 3D-structure with tiny hooks. A surface treated with this process can inter-lock like a three-dimensional puzzle with the surfaces of almost all other materials, forming unbreakable bonds. With this method, it is even possible to create bonds between aluminium and copper. The roughened surface structure of zinc in 10,000x magnification (2 µm = 0.002 mm).